Last weekend was one of the first times, in a long time, that I've been back to where I grew up for a holiday weekend. 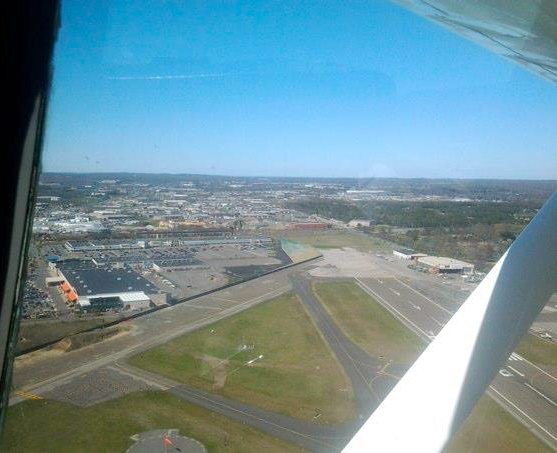 It was a beautiful Easter weekend as Laura and I flew from Morristown to Farmingdale's Republic Airport. While it was a little breezy, there wasn't a cloud in the sky. My sister had been asking to go up for a ride in my plane; so she came down to the airport and snapped some great photos as we flew over Huntington and the Long Island Sound. On Easter Sunday, I went to church with my mother and sister. The last time I was at this church was on Valentine's Day (our wedding anniversary) in 2007 as I stood on the church altar to deliver my father's eulogy during an ice storm that made the headlines. The offering hymn was one of my favorites, Lord of the Dance, which most any Marine, who's gone through boot camp on Parris Island, could never forget. One thing that I had completely forgotten about was the holography lab that I had set up in my childhood basement when I was in junior high school. The solid basement foundation was ideal for making holograms since any movement more than a few hundred nanometers, during the 6-12 second exposure, would ruin it. As an early teen, my budget was rather limited. It had taken me many months to save up enough money to buy my first two lasers. In the early 1980s, diode lasers did not exist as consumer devices, like they do today, and I had to buy much larger and more expensive helium-neon lasers. Since my budget as a 13-14 year old was limited, I didn't have enough money to buy all of the metal letters which I had started to use to label the parts of my ruby laser drawing. My ruby laser diagram may look like a cave painting in ruins, but it's actually never been completed. I doubt it every will.